If you go to the exclusive community called the Villages in North Central Florida, which is filled with many retirees, you'll find everything from golf cart tunnels to microbreweries. But one of the most distinctive features might be its 108 courts for a unique sport: Pickleball. To understand Pickleball, I spoke with David Jordan, president of the United States of America Pickleball Association (USAPA). He shared the secrets of the popular and unusual game — a sport that one retiree said was "like a drug." Pickleball is best described as a cross between table tennis and tennis. It looks a lot like tennis, but it features courts that are much smaller, a wiffle ball instead of a tennis ball, and a completely smooth paddle. In addition to being a recreational sport, Pickleball is also an organized activity. The USAPA lists tournaments on its site, and it also holds a national tournament (with 713 participants last year). How do you play Pickleball? The rules for Pickleball will be familiar to tennis fans, yet there are key differences (you can find the full official rules here). First, the court is smaller, running 20 by 44 feet. The same court is used for singles and doubles, and there's a foul zone near the net called "the kitchen." The net is about 3 feet high, which is usually the same as a tennis net. That smaller court makes for less running, less powerful hitting, and more play. You have to serve underhanded (from one side of the court to the other, as in tennis). Upon return of the serve, the ball must bounce once — then players can hit the ball whether it has bounced or not. Until the ball has bounced, you must stay out of "the kitchen." Games are played to 11, and points can only be scored by the serving team. These rules lead to what Jordan identifies as two phases of gameplay: the ground stroke phase and the "dink phase." After an initial phase of volleys that bounce and reach the back of the court, play will often move forward close to the kitchen, where players aggressively try to score a point, often without giving the Pickleball a chance to bounce. 3) What equipment is needed to play Pickleball? A Pickleballer strains for the next hit. The paddle and ball are unique. Pickleball is perhaps most notable for its unique equipment. There's no required Pickleball uniform, but there is Pickleball gear. The paddle is a flat and perfectly smooth board — there's no obvious sweet spot the way there is in a tennis racket. It's about three times the size of a table tennis racket. The ball is just as distinctive — it's between the size of a baseball and a softball and has holes in it, though Jordan says it's a little heavier than a wiffle ball. There are both indoor and outdoor balls (the indoor balls have larger holes). That has ramifications for Pickleball gameplay, as well. "You can put a spin on it," Jordan says, "but you can't do a spin on it like in tennis or ping pong." The smooth paddle and holed ball make spin a less important element of the game than it is in tennis or table tennis. How did Pickleball get its name? When did it start? The origin of the Pickleball name is mired in controversy. Fortunately, the story about its beginnings is not as disputed: in 1965, State Representative (and later United States Representative) Joel Pritchard was palling around with friends Bill Bell and Barney McCallum. The two sought a game to play, but they'd lost their badminton shuttlecock. So they lowered the net, improvised on the patio, took a wiffle ball and some plywood, and created Pickleball. The name is more complicated, since it has two competing origin stories. Jordan and the USAPA believe Pickleball was named for Pickles, the Pritchards' family dog. However, writers at the World Pickleball Federation claim, with convincing testimony from Joel Pritchard's wife, Joan, that Pickleball was named for "pickle boats" in crew. That term refers to a boat with a crew composed of leftover oarsmen from other boats. Pritchard says the dog was named later. Wherever the name came from, it stuck. And it's good for slang, too: Jordan says players will occasionally wish one another "happy pickling." Is Pickleball the last great baby boomer phenomenon? Two Pickleball players in North Carolina. Stats for Pickleball vary wildly: Jordan says the USAPA tracks about 63 new courts a month, and there is some play in college classes. Estimates for national participation range from 100,000 to what Jordan says was included in a Sports & Fitness Industry Association report that pegged worldwide Pickleball participation at 2.5 million. While we don't know exactly how many people play Pickleball, we do know a bit about who plays it. Jordan discovered the game after retiring in 2002 and becoming a full-time RV traveler. While on the road, he saw a stranger playing Pickleball ("We played for a couple of hours and got hooked"). In a way, his story is typical, since many Pickleball players are retirees. As reported by Athletic Business, 70 percent of USAPA members are 60 and up, and 24 percent are ages 40 to 59 (the USAPA says that doesn't reflect the full age range of the sport). But, in a way, that might explain why Pickleball is so popular. As a lower-intensity sport than tennis, Pickleball holds a lot of appeal for an aging boomer population that wants to stay active. And because boomers are so numerous, anything they embrace en masse can easily become a significant part of the culture. Where can you play Pickleball? Where is it popular? First, let's address where you can practically play Pickleball: the USAPA has a Pickleball court finder. If you can't find a Pickleball court, you can also modify one: Jordan says you can fit four Pickleball courts on a tennis court. To mark Pickleball courts, players use tape, chalk, or eventually lobby their homeowners association to add Pickleball lines. More broadly, Pickleball is popular across the country. Along with the massive court at the Villages, there are significant Pickleball facilities in Surprise, Arizona, and St. George, Utah. Retirement-friendly states are more likely to have Pickleball, because of their population and warmth. However, Jordan notes that indoor Pickleball is more common in the Northeast. 6) Why do some people hate Pickleball? The sound, after thousands of Pickleball games, can get pretty annoying. That's why it's been the subject of repeated noise ordinance battles. Some tennis fans don't like that Pickleball courts take over normal courts, either. That said, the Pickleball backlash is, in a way, just a measure of Pickleball's success. There may be protests but chances are, from the Villages and beyond, people will keep pickling. 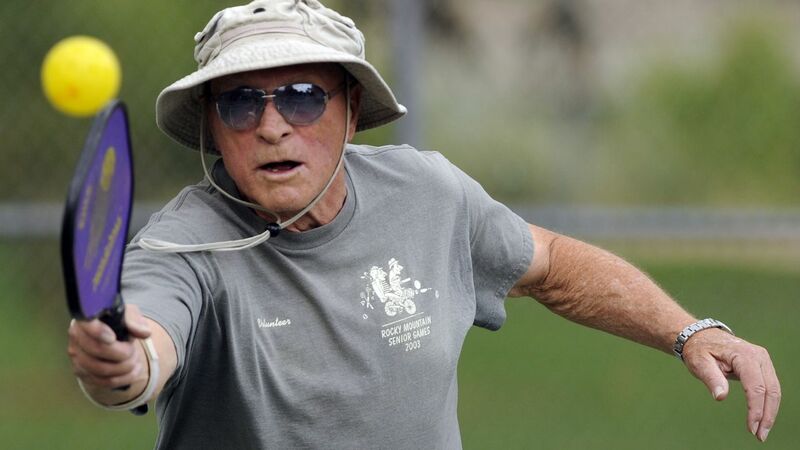 Why We Love Huntsman World Senior Games!